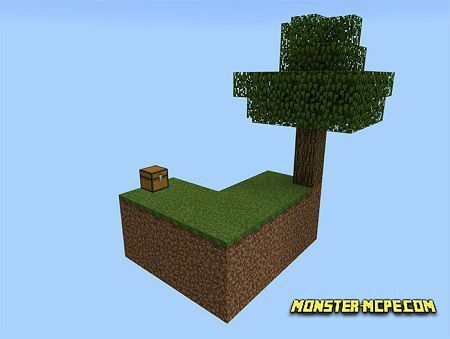 Skyblock is a popular concept for surviving in Minecraft maps on PC version. Millions players all over the world already have downloaded this cool map to their game. Now we give you an ability to get such interesting survival map for Minecraft Pocket Edition. Everyone who plays MCPE on Android or Windows 10 device can check it right now! The main idea of the Skyblock Minecraft PE map is to survive as long as you can. Players can use everything they find on the small island that floats far up above the clouds. These items will help to survive and create new buildings, and so on. The map gives to players a great chance to improve their skills for playing in non-standard conditions. You will find a chest and a tree on the floating island. Would you like to turn the small area in the big city? Well, all in your hands, friends, have a nice game!